However, when selecting an eligible character to transfer, I'm met with this error. Tried clearing my browser history, cache, using a different browser, signing in and out of website, flushing my dns and renewing IP, I'm not sure what to try next. I want to transfer my character now, I just paid to do it, why can't I? 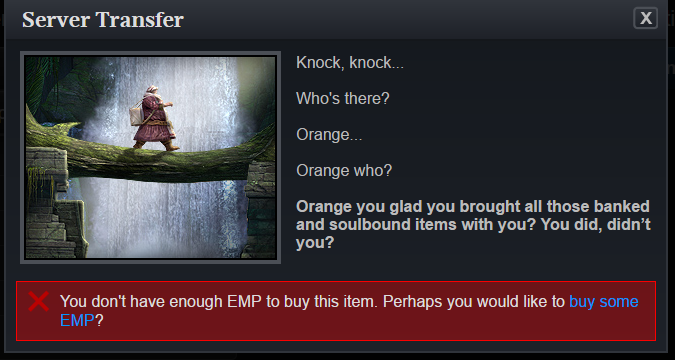 I'm now having the same issue trying to purchase Anniversary gift boxes on the TERA store web page. My EMP balance is 12050 but when I navigate to the store page, it shows 50 as if I had not charged EMP.